World War II is like an iceberg - the parts of it that we read about in history books or even learn in the classroom are really just the tip of the iceberg. Below the surface, hidden from sight, are all kinds of secrets, deceptions and subterfuge that helped win the war. So, what are some of them? Well, Stephanie Bearce has culled some of the more interesting aspects of wartime secrets and put them together in this small, but very interesting book. Young readers will learn not only how one became a spy for England, training in the grand estates around the country requisitioned for that purpose, but they will read about the Ghost Army that fought the war with rubber trucks, tanks, planes and weapons. Rubber? That's right. And that's not all they did. Kids will how read about how an Australian journalist turned spy called The White Mouse became a bane of Nazi existence because of her ability to give them the slip while working with the French resistance. Or how one man, Christopher Hutton, invented the silk map, making life so much easier for Allied pilots and parachutists, because their maps were now so lightweight and indestructible. Hutton went on to invent other useful things for soldiers, including a special Monopoly game that could be sent to POWs and contained escape equipment. There is lots of interesting information about secret missions, like, exactly what Julia Child was cooking up during the war. Or the secret city that really didn't exist but did exist, and designed to fool the Japanese. And readers will learn all about Rat Bombs, Bat Bombs and Doodlebugs. But my personal favorite was the section on Code Talkers. I've always liked codes and ciphers, especially the Enigma (one of these days I am hoping to post instructions for making a simplified Enigma out of a Pringles container). And I, like many of you, have heard of the Navajo Code Talkers, but never really understood how the coding worked. Bearce gives a short history about this special group of men, and how they devised their code, and includes a simplified dictionary for solving her Code Talker's Challenge. In fact, in each of the five sections that the book is divided into there are corresponding projects that kids can do or things they can make, such as a simple spy obstacle course or a fingerprint kit, or even a book safe. Scattered throughout each chapter are sidebars of even more interesting information or facts that will intrigue readers, such as how Ian Fleming came up with the name Jame Bond for his famous agent 007. And at the back, you will find Bibliography and a list of websites where readers can get additional information on all the topics covered. Spies, Secret Missions & Hidden Facts from World War II is sure to please budding history buffs and anyone else who just likes a secret. 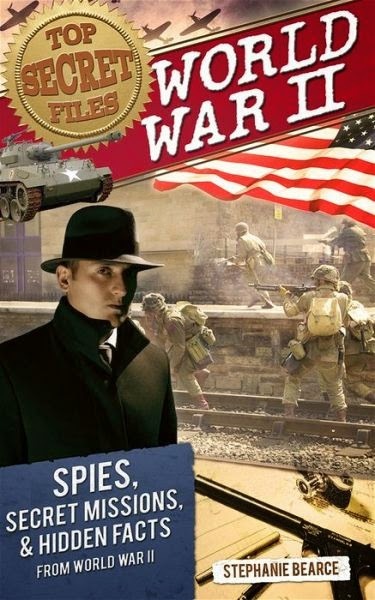 A 5 copy giveaway of Spies, Secret Missions & Hidden Facts from World War II is going on over at Goodreads until October 28, 2014, so head on over there if this sounds like a book you would like to own.